Prime Minister Narendra Modi on Monday held a roundtable meeting with the CEOs of top global companies before his keynote address at the plenary session of the World Economic Forum (WEF) here on Tuesday morning.India also got a thumbs up from the International Monetary Fund (IMF) on Monday, which reaffirmed that India's economy is projected to grow by 7.4 per cent in the next fiscal year. 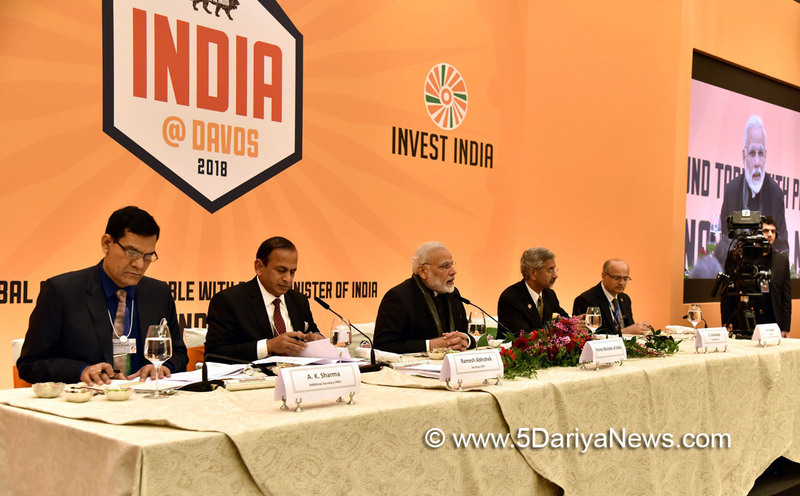 "Narrating India's growth story and presenting exciting opportunities for global business in India at #Davos, PM @narendramodi hosted a roundtable meeting with CEOs of top global companies," Ministry of External Affairs said in a tweet.Mahindra Group Chairman Anand Mahindra, who had also participated at the meet, tweeted: "Let me add my compliments to you all. You did us proud with your world-beating organizational skills. Every global CEO was floored by the personal touches in your hospitality. I am proud to be on the board of Invest India." "In addition to listening to PM keynote address at the plenary session, participating and speaking in several sessions I look forward to joining the Yoga classes on the Alps early morning ! India's soft power is on full display at World Economic Forum," Amitabh Kant, CEO, NITI Aayog tweeted.The IMF reaffirmed that India's economy is projected to grow by 7.4 per cent in the next fiscal year, regaining the rank of the world's fastest-growing large economy as China slows down.Like India's improving economic performance, the global economy was also on the uptick, estimated to have grown by 3.7 per cent last year and forecast to grow this year and the next by 3.9 per cent, according to the Fund's World Economic Outlook Update.At the release of the Update in Davos, IMF head Christine Lagarde said that for the world economy, "all signs point to a further strengthening both this year and next," but cautioned that "complacency would be a mistake." Earlier on Monday, Modi held a bilateral meeting with Swiss President Alain Berset who greeted the prime minister with a warm handshake in this town in the Swiss Alps before leading the Indian leader to the meeting. "On reaching Davos, held talks with the President of the Swiss Confederation, Alain Berset. We reviewed the scope of our bilateral cooperation and discussed ways to deepen it even further," Modi tweeted.This is Modi's second visit to Switzerland in nearly two years after his visit in June 2016.Modi is the first Prime Minister from India to participate in a forum meeting in two decades after the then Prime Minister H.D. Deve Gowda in 1997.He will interact with 120 members of the International Business Council, which is a part of the WEF.Modi, in the course of his 24-hour visit to Davos, is also scheduled to hold a bilateral meeting with Sweden Prime Minister Stefan Lofven on Tuesday.